Discover the best of the Queen City of the South! Piso Fare is the most awaited promo fare in the Philippines. 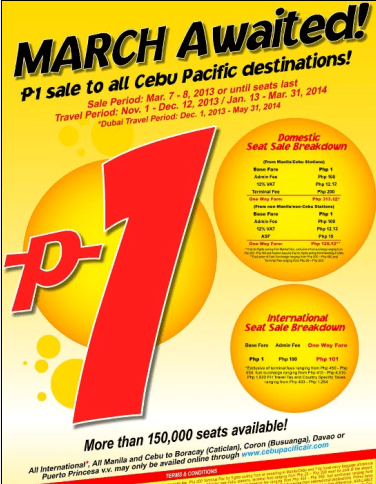 This seat sale promo was made popular by Cebu Pacific Air, the Philippines largest budget airlines. Other airline companies like Philippine Airlines, Airphil Express, Zestair, Tiger Airways, Air Asia and others also embraced this concept and offers Piso Fare promos in different occasions. What is a Piso Fare Promo? Piso Fare are promos by airlines to gather more passengers for future flights. Most seats offered are sold months in advance and usually falls on the off peak season for flying. It is called Piso Fare for the BASE FARE for such tickets are priced at 1 Peso only. But passengers need to be advised that there are other fees and taxes that they still need to pay on top of the 1 Peso Base Fare. For those looking for the latest Piso Fare promo, better check out this Cebu Pacific Piso Fare Promo for 2013 and 2014. This seat sale covers all the destinations covered by Cebu Pacific from Luzon, Vizayas and Mindanao. Now you can book affordable tickets to the best Philippine tourist spots and attractions like in Manila, Cebu, Bohol, Iloilo, Palawan, Legazpi, Naga, Ilocos, Davao, CDO, Cotabato and more. Also included in the Piso Fare 2013 and 2014 are international flights to Hong Kong, Singapore Macau, Malaysia, China, Japan, Taiwan, Cambodia, Brunei, and Vietnam. Even their long haul flight to Dubai, UAE is included in this Piso Fare promo. Selling of tickets is ongoing and will end on March 8, 2013. Travel date starts on November 1, All Saint’s Day, up to December 12, 2013. This is great for those who want to avail cheap tickets for All Saint’s day or those who are planning on an early Christmas Vacation or Christmas shopping in Hong Kong, Macau and Bangkok. Travel period resumes on January 13, 2014 up to March 31, 2014. This is one of the earliest Piso Fare 2014 promo and is great for Valentine’s Day and for Summer 2014. What are the flight destinations of Cebu Pacific Air? If you are wondering which flights to book for your next vacation using this Cebu Pacific Piso Fare promo tickets, kindly check out the list below for all their domestic and international flights. How much is a round trip ticket for a Cebu Pacific Piso Fare promo? Every ticket differs in price. Even though tickets are offered at 1 Peso Base Fare, ticket prices are still dependent on other factors like the point of origin to destination plus the optional service availed by a passenger such as meals and check in baggage. Just to give you an idea on what to expect on the final price of a Piso Fare ticket, we’ve conducted an actual booking for a round trip flight from Cebu to Pagadian, a city in Mindanao. This ticket availed the 15 kilos check in baggage option for both trips. Check out the details and final price below. Where to book Cebu Pacific Piso Fare tickets? 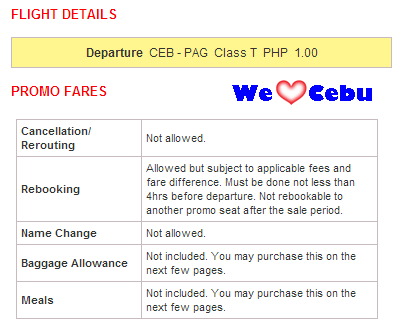 Bookings can be done at the Cebu Pacific Air booking website at http://cebupacificair.com. You can pay tickets booked online by using your Credit Cards, Atm Cards or paying at various Over the Counter payment sites. Passengers can also avail their tickets at any of the Cebu Pacific Sales Offices located in various airports and malls as well as to any of their travel agents. So what are you waiting for? Book now and get to see the best the Philippines has to offer. Yo can also go on an affordable trip and see beautful sites like Bali Indonesia, Hong Kong Disneyland, Universal Studies Singapore and the casinos in Macau. Like the WE LOVE CEBU Facebook page to get more on Cebu news, promos, events and travel tips. Hi Jet, for now wala pang ongoing Cebu Pacific Piso Fare promo… we will update this blog par meron ulit. Thanks for reading We Love Cebu!!! 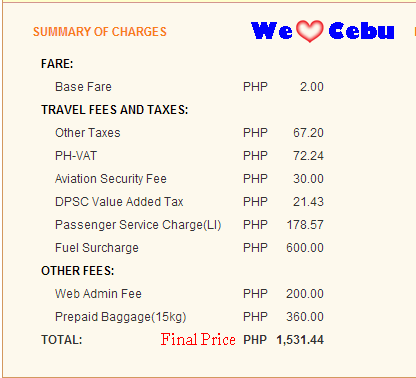 Hi Revely, we will post po ulit pag may Piso Fare Promo po ulit ang Cebu Pacific… thanks for reading We Love Cebu. Hi Jovelyn… we will po po agad kung meron ng Piso Fare 2014 for Hongkong…. thanks for reading We Love Cebu. hope you can post piso fare again..
Hi pogs… Yes we will post again pag merong Piso Fare promo… thanks for reading We Love Cebu!! JAN.01 pabalik ng may nila,meron po bang piso fare? sana meron,para makabakasyon family ko. April 2014 meron ba kaung promo from manila to cebu and cebu to manila..please reply kung kailan puede magbili ng ticket,,thank you. Hi, for now, wala pa po. Hi Novee, thanks for reading We Love Cebu.. For updates on our post, kindly like us on our Facebook Page, thanks!!! Piso fare to manila month august meron bah? Hi Cindy, for now there are no offers for Piso Fare seats for the month of August 2013. Hi Mhike, kindly like our Facebook Page so that you will receive our latest post and promo fare alerts… thanks for reading We Love Cebu!! may peso fare to Iloilo? Hello po available na po bang ang Piso Fare for Hongkong january 2014? may piso fair po ba april 2014? Hi po. Meron po bang promo for internatonal, Low fair? Question po.. we are about to return to Manila on Sat. from Bangkok and we are using the promo fare of Cebu Pac. Do we still have to pay for things like Travel tax or Terminal Fee at the Suvarnabhumi Airport?Thanks so much for your help!! how can i avail this piso fare?? thank you! Tanong ko lang po kng wala kaung promo sa july or august?pls po balitaan nyo po ako..
May promo ticket po kayo sa januar30-feb2? Hongkong destination po…magkano? Thanks. paano po ba magrebook?. july 12 ng gabi ang original flight namin. pwede po bang maging july 13 na lng ng umaga? promo rate kami pero hindi piso fare.. tanong ko lang kung pwede ba ang ganitong set-up.. thanks po. Sana po maka avail po ako nang piso fare ninyo. Sana kung meron kayo eemail or tawagan nyo ako. Palawan or hongkong or singapore. Tnx po …. MAY PISO FARE PO BNG PROMO CBU TO ILOILO????????? Piso fare to thailand january pls let me know thanks……. can i avail the piso fare manila to gensan vice versa this sept.? thank you! this promo has ended na po. Available pa po kyo Manila Bohol for 2 way for 4 adult 4 children?pra po sa august 2013? Your sale period was last May 12-13, 2013, I was late in knowing about this P1.00 fare, pwede pa bang mag pa book for March 2014? For now, wala pa pong piso fare for 2014. My promo fare ba This coming august? How much the regular fare from cotabato to bohol? Hi sorry. we don’t do bookings here. Hi, there are no direct flights po for Davao to Indonesia. hi….. including dubai po pa ang PISO FARE??? or from dubai to manila??? Hello po. May flight ba ung peso fare sa September 1 papunta ng kota kinabalu sabah malaysia at may promo din? No promos for September po..
Hi! do you have piso fare promo roundtrip from Pagadian to Manila?thanks. available pa po ba tong piso fare?? My pr0m0 b kau manila to 0zamis 0zamis to manila thank y0u. I wanna know po ung promo for next year me and my family are planning to celebrate my daughters birthday in abroad po eh..
Kindly Like us on Facebook, we will post new Piso Fare promos in the future. Thanks for reading We LOVE Cebu. Available p po ba tong peso fare ngaung november po? Hello, may promo pa po ba na piso fare to Hongkong for 2014 ? Thanks po. tanung ko lng po …..kung my promo kau ngaung dec.18 to 27?at magkano ung fare? Hi available pa ba ang piso fare roundtrip manila to hongkong disneyland? Can you pls send the example quotation for this? Thank you. my available seat pa ba as January 17 2014?itong lite fare promo nyo? Hi…meron po ba kayong promo ngayong april 2014 Manila to Masbate? meron po ba kau flight manila to catarman?may promo po ba sa september 2014? meron pong piso fare, manila to dumaguete april 2014? Hello! do you have international piso fare on April-May 2014? Thanks and more power! meron po bang peso fare manila to cagayan this dec.31 2013 rountrip back to manila jan.6 2014..
Hi po meron po ba kayong peso fare this january 9?please reply..magpabook po sana ako..only one person lng..
Pwede po ba akong magpabook ng flight na kahit hindi via online?direkta na poh akong magpabook at kuha agad ng ticket…pwede po ba? You can try booking po sa Cebu Pacific offices, but currently, there are no Piso Fare available for 2014.
how can i book this promo? this promo’s are still available? Meron po ba kayong promo fares from masbate to manila on any dates of March 2014?kindly inform me. I want to have reservation for two persons. And on November 5, 2014 as well. Hi po, wala pong direct flights from Malaysia to davao po. Magkano ang surcharges and fees manila to hongkong? Nagbabago ba ito base sa date of schedule? hi i want to book a flight form manila to davao on march 10..i want the earliest flight 3:30am..2 adults and 1 child 4 yrs old….i want 20 kls each passenger…may promo po ba kau at this moment..thank u…. Hi do you have promo for august 21,2014 from manila to bacolod??? May Pagadian City po ba to Palawan? Hi, there are no flights po going to Palawan via Pagadian po. Meron po bang promo from butuan to manila ?? May piso fare po ba ds coming July 2014? Mam yung new promo po is for Jan 2015 to March 2015 na piso base. hi… klan may available ng piso fare to palawan? hi, meron po ba kaung flight from manila to vietnam roundtrip promo? Hi Maricel, we will post new Piso Fare promos in the future for domestic and International destinations. Hope you can Like us on facebook so that you can get updates, Thanks!!! hi do u still have a promo piso fare via Clark to Cebu round trip? pls pm me at 09279739153 thanks in advance! Hello,do u still have a promo piso fare on a roundtrip from gensan to manila on november 22 and be back on november 28….pls pm me for details at dis #:09482903072..Thank you very much and God Bless! Our recommendation is you try trial booking for your destination, free lang naman po yung mag mock booking. Sana makatiming ka ng promo fare for 2015, hanap-hanap lang. meron po ba kayo peso fare sir ngayon 2015?? Work in Taiwan as a new member of the OFW community as a Forklift Driver Operator in a Top Textile Company. Discover what makes Cebu one of the best destinations in the Philippines!